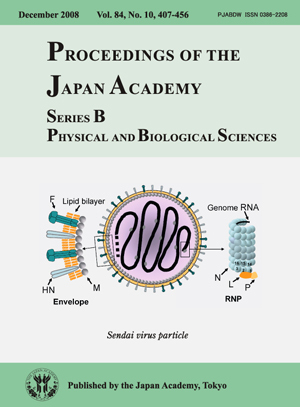 Sendai virus (SeV) is the type species of the genus Respirovirus in the family Paramyxoviridae and causes fatal pneumonia in mice. The SeV particle (virion) is spherical, with a diameter of approximately 200 nm. It consists of an inner RNP (ribonucleoprotein) complex and outer envelope. The RNP has a left-handed helical structure 1.1 mm in length and 18 nm in diameter, with a pitch of 5 nm, in which the 15,384-base RNA genome of negative sense is encapsidated with the nucleocapsid (N) proteins. A single N protein unit is thought to associate with 6 bases. The large (L) and phospho- (P) proteins, the subunits of the RNA polymerase complex involved in genome transcription and replication, attach to the 3’-terminal site as well as occasionally to other sites on the RNP complex. The envelope contains two types of glycoproteins protruding in the form of spikes that are anchored within a lipid bilayer derived from the plasma membrane of host cells. One of the spike glycoproteins has hemagglutinin (HA) and neuraminidase (NA) activities and is named HN. The HN protein recognizes terminal sialic acids in the sugar chains as the receptor on the target cell surface. 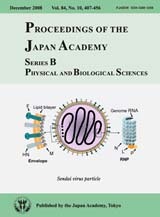 Its NA activity is essential for the release of progeny virus from the cell surface. The other spike glycoprotein is named F because it induces fusion of the virus envelope with the host cell plasma membrane, thereby introducing viral RNP into the cytoplasm. The matrix (M) protein is located between the envelope and the RNP. The M protein serves as an anchor to stabilize the spike glycoprotein molecules floating in the lipid bilayer by binding to their cytoplasmic tails and also binds to RNP, thus cross-linking the inner and outer structures. The M protein is indispensable for structural proteins to assemble into virus particles as well as for viral budding from the plasma membrane. SeV further encodes two accessory proteins named C and V. Although nonstructural and not incorporated into the virus particle, they play essential roles in pathogenesis in mice by counteracting the antiviral innate immunity.